You have seen the Cake button on your pressure cooker and probably wondered how it would work out. Well, try this recipe and find out! 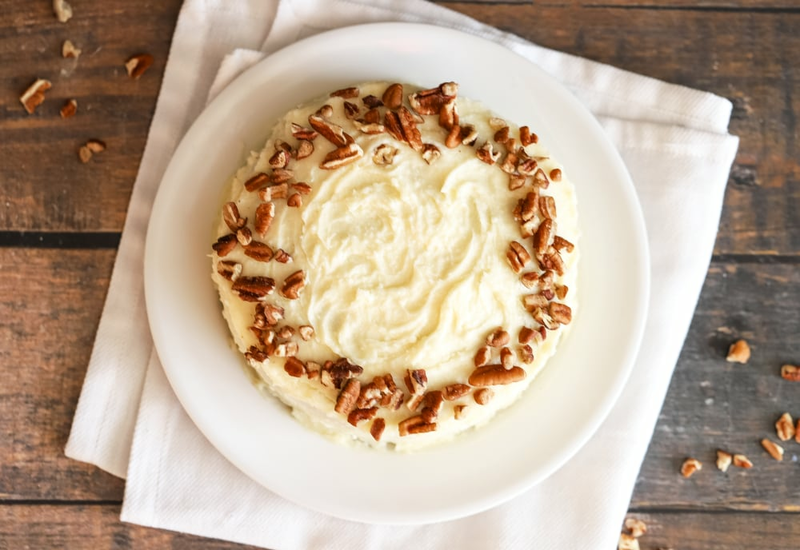 Moist, thick, and delicious carrot cake is easy to prepare using the Cake setting on your pressure cooker. You will love the moist texture of the cake, as well as the accompanying homemade cream cheese icing. Spiralize some carrots for a fancy garnish! Beat eggs and sugar together in a bowl until smooth; add flour, half-and-half, canola oil, baking powder, vanilla extract, cinnamon, and nutmeg. Stir the mixture until you have a fluffy batter; fold carrots and pecans through the batter. Pour batter into a 6-inch cake pan; cover with aluminum foil. Pour water into the pot of a pressure cooker. Place steamer rack over the water. Gently lay cake pan onto the trivet. Select Cake and cook for 40 minutes on High pressure. While the cake cooks, beat cream cheese, butter, confectioners’ sugar, vanilla extract, and salt together in a mixing bowl until smooth; refrigerate until ready to use. Remove cake from the pan and place on a cooking rack to cool completely. Spread frosting over the cake; top with shredded carrots, as desired. For a nice boost of flavor, toast whole pecans before chopping. You'll love the flavor they lend to the cake. Using a springform pan can help make removing the cake easier. Per Serving: 462 calories; 32g fat; 40.0g carbohydrates; 6g protein; 120mg cholesterol; 187mg sodium. Very good, especially the frosting. If I make this again I would add more spice and maybe a little more sugar or maple syrup to the cake batter. The cake was really moist and delicious. I decorated it with frosting, and created little carrots with orange and green food coloring. Makes just enough for about 4 medium slices or 8 kid size slices. I toasted the pecans and added raisins. I really enjoyed this recipe, it was delicious and moist. My only complaint is that it's so small! I used brown sugar and added cranberries. The texture was more like bread pudding than cake but it was still very flavorful. Just a bit flat and dense.